INTRO – BUMPER NEW YEAR ISSUE! BUT, let’s look forward to 2019 with at least a bit of optimism – especially as there is quite a bit of good news about Otley’s pubs already this year. There are a couple of items below: one about one of the newest bars in town – Groove Pad Beer and Vinyls, and the other about the biggest pub – The Black Horse Hotel. The brand new bar on Kirkgate – The Rookery – is now fully open for drinks and entertainment, and the new landlord of The Rose & Crown is gradually increasing his opening hours as all the final bits of refurbishment work are completed. Alongside all the usual annual festivals and celebrations in town, we’ll be seeing the final stage of the Tour de Yorkshire cycle race coming through on Sunday May 5th. Later in the year, on Saturday and Sunday September 28th and 29th, the best women and men road racer in the world will be coming through as part of the UCI World Championships, which will be based in Harrogate. More about that event later as well – so read on. PREMIER CARDS – NOW ONLY £5!! At the moment the cards are on sale in The Curious Hop in New Market in Otley, but as soon as our bank account has been changed [darn those pesky bank closures!] we’ll be putting a Paypal/card payment option on the website. That will make it even easier for you to join our existing 60-odd card members [– and do tell your friends! You don’t have to be an existing Otley Pub Club member to buy a card.] And a Happy New Year to you all! DID YOU ENJOY A DRINK OVER CHRISTMAS? THIS SPRING, DON’T (LET YOUR DOG) WORRY! An article in The Wharfedale Observer last week reported the case of a 14-month old puppy that had got loose from its premises and chased sheep and lambs in a field. 4 of the lambs died during or after the incident. The dog in this case was a malamute, but don’t let that fool you. Even my two sorry-looking specimens alongside were always a struggle to keep next to me if we ever came across sheep out on the hills. If they hadn’t been on the lead, they would have been off after them like a flash – and they don’t need to savage the sheep to harm them. As the wildlife officer in this case said “When a dog runs amok among a flock of sheep it can do a huge amount of damage (just) by panicking the animals.” Incidents like this don’t just harm the sheep – which is obviously bad enough – they can also damage the farmer’s business. What’s more, if it’s your dog that’s got loose and caused the damage, you might be lucky enough to be let off with paying the farmer’s costs, but you could also find your dog being taken away from you – or perhaps even worse. [But if you’re a farmer, see this legal advice about whether dogs can be shot or otherwise injured on your land. It’s not that straightforward.] So the best advice for dog owners is – don’t worry, be happy! Almost every month the news contains at least one heart-warming story about an old inn, or a community pub, being saved from sale and/or closure by the local community. CAMRA has given its pub saving award for 2018 to a group of people in Somerset who re-opened their village pub and now run it as a community venture, as reported here in The Guardian]. Punch had sold the 15th century Packhorse Inn in the village of South Stoke for conversion to residential accommodation, until the community achieved what is believed to be the biggest pub buyback in the country. What makes this particular story so amazing is that the population of South Stoke is only around 400, but the action group managed to raise one million pounds to buy the property! The village is just a few fields outside the main urban sprawl on the South side of the city of Bath, so you can only assume that many of the 500 contributors [and the 1,500 people who signed the original petition] can’t actually call it their ‘local’. Nevertheless, it’s a great success – and maybe when our own Black Horse Hotel has been similarly saved, the contribution from the community of Otley will be similarly appreciated. Talking of The Black Horse Hotel, the community group [LS21] who are putting together a bid to buy it for the community made a presentation to the attendees at the Otley Chamber of Trade meeting last week. A good crowd of 30 to 40 people heard that LS21 have now virtually guaranteed the money they need to buy the building from Ei, but that they still need 100 shareholders at £2,100 each to finance the necessary building works to make their vision a reality. The main work needed will be in the external stables area, where re-roofing and soundproofing will be needed, as well as work to convert the stables into a performance area that will take up to 400 people. There are only 14 weeks left for the company to finalise their bid, so we’ll try to keep you bang up to date with progress from now on. The Chamber also promoted their Otley Business Awards competition for 2019, the presentation of which will be coming up in March. Unfortunately, the voting for your favourite businesses in each category ended on Friday the 18th of January – so you’ve missed your chance to vote now! There are 12 award categories, from best newcomer to lifetime achievement award and last year there were over 100 nominations in the various categories. If you’re not lucky enough to be attending the presentations, we’ll report on the winners in the newsletter following the event. BEST NEW PUBS IN BRITAIN – ONE IS IN OTLEY! It’s been reported in The Morning Advertiser that Ei has agreed to sell 370 of its 412 commercial properties to a US-based hedge fund which will operate them under the name of Tavern Propco. Ei said the properties were “best suited to a free-of-tie rent-only model” so they themselves were obviously not prepared to implement that model in the 370 properties while they still owned them! At first it sounds like good news doesn’t it? Almost 400 pubs released from the failed tie/die business model, to be given more consideration in a free-of-tie environment. But a 31 billion dollar international hedge fund is not likely to be going into a market that it can’t control, so I wouldn’t expect the shackles to come off immediately. What’s more, as Ben Wilkinson from CAMRA said “too many times in the past we’ve seen large pub company disposals result in the closure of viable pubs” – and we’re still waiting for the fallout from the last unloading of Punch properties to Heineken! Check out the article itself for more on the story. Apollo3D have recently arrived in Otley having moved into offices at Wharfebank Mills. Owned and run by Mark Shepherd and Rob Wilyman, they are in the middle of a very exciting project for January. You know how sometimes, if you’re in a strange town and fancy a drink, you don’t always want to go into a pub unless you can get a good view through the windows first? Well, using their state of the art 3D camera and drone technology, Apollo 3D can let you look round every room inside a pub without even leaving home! [Once you’re in the pub, you can even look on your phone to see where the toilets are, or what the other room round the corner is like!] You may have seen some of their work already for Buon Apps, The Mill Bar & Bistro and KT Greene. But now they are underway with creating a 3D walkthrough of every pub in Otley. I mentioned in the introduction that The UCI [Union Cycliste Internationale or International Cycling Union) road world championships men’s and women’s elite races are coming through Otley later this year. 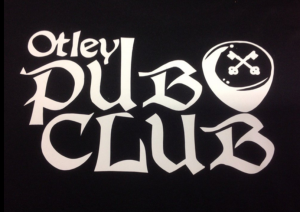 As we did for the Tour de France in 2014, Otley Pub Club want to mark the occasion with one of its now-famous pub projects. We haven’t got much further than hoping to allocate a different one of the top cycling nations to each of the pubs on the route [and elsewhere in town if the pubs want us to]. The reasons for another project would again be twofold: to attract cycling fans from the countries involved to come to Otley and visit their pub; and to once again raise the profile of Otley and its pubs on local, national and international media. Tell us right now if you hate the idea, or watch out for more progress during the next 8 months. BLACK SHEEP TAKES OVER YORK! COMMUNITY PUB? COMMUNITY HUB? REALLY? Referring back to a couple of the earlier articles above, about saving community pubs, and corporate takeovers, what do you make of these two stories? First, you’ll probably remember us telling you a year or so ago about a previous batch of Punch pubs being taken over by New River Retail [i.e. before the latest Heineken lot]. The Bay Horse in Otley was included in that batch. For the pubs that New River couldn’t convert into local supermarkets or other retail outlets, they put in another layer of corporate management – LT Management Services. For the Bay Horse that meant closure, then the installation of a temporary manager; then closure, then a tenant full of good intentions who eventually left; and finally now a period of stability under the new management. So I found it amusing to see New River using the words “Community Pub” to describe The Keg and Kitchen which has opened in The Ridings shopping centre in Wakefield. The centre is operated by Hawthorn Leisure – newly “integrated” with New River REIT. To be fair, I haven’t visited the Keg and Kitchen, and it might be a very nice ‘outlet’, but I doubt it has all the attributes of a community pub – or ever will have, in the middle of a [probably] soulless city centre shopping mall. Read for yourself the article making the announcement here in pubandbar.com news, and see whether you think New River and Hawthorn care about communities, about pubs – or about business profits! Second is a typical story about that old eternal triangle of pubs, developers and local authorities! The Monson Arms in Lincoln had been part of the community for over 50 years, when it was bought by developers who wanted to build a care home on the site. [Sound familiar yet?] The City of Lincoln council refused the application and the pub has stood empty since early 2016. The site was sold on to the Co-op, who have an existing store on the opposite side of the road. They now intend to convert the Monson Arms into a bigger Co-op, 2 smaller shops, and 10 apartments [as well as 12 more apartments on the site of their old store]. Details are in this article from The Lincolnite. So far, so similar to The Summercross in Otley, but here’s the rub – the development manager for Lincolnshire Co-op said the new site would ”become a hub for the community for decades to come”. Come on! It’s a shop – and you had a shop over the road already. A community pub is a community hub. This is all about making money, nothing else. While several hundred thousand Government workers still remain unpaid in the USA while the Trump-v-Senate standoff continues, spare at least a small thought for America’s craft beer brewers. According to this article from NBCNews.com, the inability to get Government approvals could hit their profits hard. Approvals from the agency’s tax and trade bureau range from permits for new facilities to new labels on cans. To ship beer over state lines, breweries need certificates of label approvals from the ATF’s trade bureau for any new packaging or beer branding. So as the article says “in a business dependent on releasing and marketing new beers regularly to quench its customers’ expectations for novelty, those delays could potentially be financially devastating.” I bet Sam Smiths have never had this problem! Errr – bit of a disaster this month, as I haven’t received any information from the Pub Liaison Officers at all! [Apart from one . . . me! And even I won’t go back to a pub a third time, if they can’t tell me what’s on the first two days I call in!] Maybe it’s because they’re all suffering from #Januaryblues, like I said in the intro. Anyway, just keep checking all the links below AND keep checking back here, as I’ll hope to edit the entries online through the month. Looking for something different for that someone special, why not give them a Groove Pad gift voucher. Now available in the bar. Still a few days left in January to get cask pints at £2:95 and double gin and mixers at £5. Offer to OPC Premier card holders is 10% off clothing and vinyls on production of the card. They will also be stocking one of each of the OPC T-shirts/hoodies for customers to order through them, as well as stocking the Premier cards themselves! Manor Sessions every Thursday from 8pm ‘til late – the home of live acoustic music. Every Tuesday night people gather to play folk music upstairs. Quiz restarts mid-February. Keep checking Facebook for details. Now open in the evenings until all snagging is completed. Watch out for announcements of new opening hours. Watch out for offers coming up. Current suggestion is buy a pint on a Friday night and get a free shot. [I’m sure if you have any other suggestions, they’d love to hear them! We haven’t been able to discuss the existing offer to OPC card holders with the new management in detail, but it should still be 10% off food AND off room bookings. Please check with staff onsite before committing to expenditure though! Offer to OPC card holders is 10% off all drinks and food (Card holder + any party up to 6 in total.) Stew and a pint is about £11 – buy 5 of those and you get your fiver for your Premier card back in one sitting! H&F will be showing ALL 2019 6 Nations televised games, starting on Friday Feb 1 at 20:00 with France v Wales. Offer to OPC card holders has been withdrawn by Market Town Taverns, as they have their own loyalty card starting this year. So why not ask for one of them when you go in? Check the facebook page regularly for updates on music and quizzes! And don’t forget it’s 50p a pint off on Mondays!! The Fleece will be closed from 11-13 (inclusive) of February. Valentine’s Day Steak and Fizz Special – Sharing board with 3 steaks: fillet, rump and striploin; 3 sauces, salad, tomatoes and chips plus a glass of pink fizz each.All for only £50 per couple! Offer to OPC card holders is 10% off drinks at the bar [cardholder + 1]. Buy a card for a fiver, and after about 17 pints you’re in profit!